Rita Ora’s Complete Dating History – Who Has Rita Ora Dated? Home Musicians Rita Ora’s Complete Dating History – Who Has Rita Ora Dated? After appearing on DJ Fresh’s single “Hot Right Now”, which reached #1 in the UK and dropping her debut album ‘Ora’ which also peached at No. 1 in the U.K, British singer and actress, Rita Ora, has remained a name to reckon with in the industry as her songs have continued to top the U.K charts. In 2017, two singles from her upcoming album, “Anywhere” and “Your Song” reached the UK top-ten. Her third single “Girls” from the upcoming album dropped in May 2018. Although the song which featured notable artists like Bebe Rexha, Charli XCX, and Cardi B was well received by many as a bisexual anthem, some lyrics from the song, didn’t go down well with American singer/songwriter Hayley Kiyoko. “Girls” contains lyrics like: “I ain’t one-sided, I’m open-minded, I’m 50-50 and I’m never gonna hide it,” and Kiyoko who is openly a lesbian feels the message the song passes does more harm than good to the LGBTQ+ community. She added that a song like that fuels the male gaze and marginalizes the idea of women loving women. The “Everywhere” artist quickly apologised to the LGBTQ+ community, stating that she never meant to harm or offend the community with her song but only hoped that her art will empower her fans to feel as proud of themselves as she is learning to feel about who she is. The new single was Rita Ora’s way of clearing the air about her sexual orientation and this has got fans who didn’t know her as bisexual, wanting to know more about her past relationships and who she has dated over the years. Rita Ora is one super hot female celebrity who has been romantically linked to so many stars in the industry. Here is all you need to know about the charming singer’s dating history. Ora is currently dating rocker Andrew Watts. They were first rumoured to be dating in the summer of 2017 as they were spotted almost everywhere together in a romantic atmosphere. They were seen together in Rome, sitting on the steps of the Piazza di Spagna, all cuddled up as Andrew kissed her forehead. Despite the singer insisting she and Andrew are nothing more than just good friends, she wouldn’t stop gushing about him on social media – and Andrew? he, of course, returned the favour. Rita Ora couldn’t keep the secret any more as she spilt the beans early in 2018 at a pre-Grammys Warner Music party where she told The Mirror that she and Watts were having a great time together. They were inseparable from each other throughout the event. Andrew Watt used to be a member of the California Breed band alongside Black Sabbath’s Glenn Hughes and Jason Bonham. After the group disbanded in 2015, he went into writing and producing. He wrote the lyrics for Rita and Liam Payne’s song, For You, from the upcoming film Fifty Shades Freed and also co-wrote “Let Me Love You” by DJ Snake and Justin Bieber. The singer and Blink 182 drummer Travis Barker dated briefly in 2015. The pair made headlines after they kicked off their relationship in September following their meeting at the Power 106 All-Star Game held in L.A that month. However, the romance lasted for just one month. Travis told Daily Mirror that he doesn’t have the desire to be in a relationship 24/7. The X-Factor judge dated rapper Ricky Hill, the son of American fashion mogul Tommy Hilfiger. The pair dated for thirteen months before calling it quits in July 2015. Rita Ora also dated Scotish singer/songwriter, DJ and record producer Calvin Harris. The mega DJ later took to Twitter to announce that the fourteen-month-old relationship (April 2013 – June 2014) was off. Well, not many were surprised by their spilt as the British singer, in an interview with The Mirror the month before the break-up, stated the challenges she and Harris had to face. According to Ora, she is not a fan of long distance relationships and it has been a struggle making their relationship work. In early 2013, the pop star briefly dated football agent Dave Gardner who is 15 years her senior. It wasn’t clear what led to their break-up, but the two are reportedly still in good teams. Rita Ora dated the prince of the Kardashian family Rob Kardashian in 2011. The romance which began in November 2011 came to an end in December 2012, after Rob called it quits, citing unfaithfulness. Rob claimed, Ora cheated on him with nearly twenty guys. 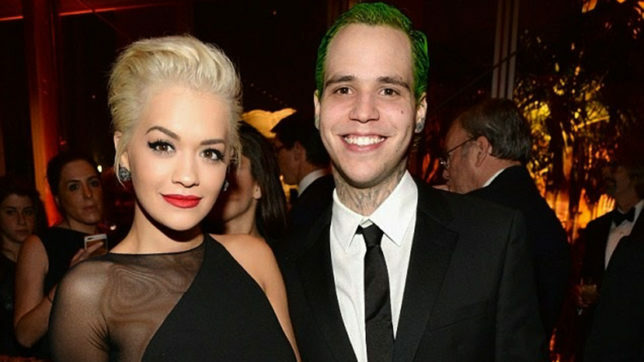 This is Rita Ora’s longest relationship so far. She began dating the multi-talented singer Bruno Mars in February 2009 when the pop star was just 18 years old and the relationship lasted till February 2011. Rita said it was love at first sight and that their time together was wonderful until they got famous, work got in the way and they had to call it off. Also Read About: Nicki Minaj’s Relationship Through The Years – Who Has Nicki Minaj Dated? The hot Brit singer has also been rumoured to have been romantically involved with many other top celebrities like Chris Brown, Drake, Snoop Dogg, Jay-Z, Jonah Hill, ASAP Rocky, Cara Delevingne, Evan Ross, James Arthur, Justin Bieber, Lewis Hamilton, and Wiz Khalifa. Although she did hook up with some on a date or two, was caught kissing others behind cameras, some were nothing but mere rumours which were never confirmed.